Pantaloon Retail India Ltd CEO, Kishore Biyani India’s leading retalier, announced his plans to launch Big Bazaar Clubs on the lines of Sams Club and Metro Cash & Carry. Sams Club and Metro cater to small businesses. The first Big Bazaar Club will open in Ahmedabad, Gujarat. Looks like Kishore Biyani wants to challenge head-on to Reliance Retail chief Mukesh Ambani who is also building his Reliance Hypermarkt in Ahmedabad. Great Move Biyani!!! The Big Bazar Club outlet in Ahmedabad will be 13,000 sft in size and is targetted at Hotels, small retailers and also big joint families who do bulk purchases. It will stock fewer items than current Big Bazaars but will be priced cheaper. 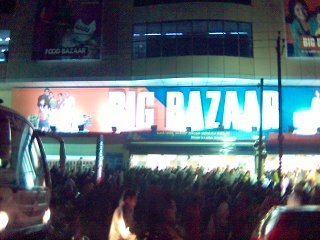 Increase Big Bazaars from 39 stores to 50 by end of Jan-2007. Big Bazaar to have 100 stores by December-2007.